Magnesium oil: Benefits, Uses, deficiency symptoms and side effects! You are here: Home / General Wellness / What are the benefits of Magnesium Oil? While talking about Magnesium Oil not many people know that it is extremely good for our body and in more than one ways. Inside our body, Magnesium acts as a catalyst in energy productions. According to some studies, a human who weighs around 70 kg contain between 21-29 gm of Magnesium. We are unaware of the health benefits of magnesium oil, and thus we need to make a lot of changes in our lifestyle henceforth. What is the Background of Magnesium Oil? In our body, the magnesium ions are most commonly found in bones. It plays another role as enzymes as well while breaking down whatever food we eat into energy. The most pivotal of all the benefits of magnesium oil are acting as remedies for several therapies. In chromosomes, cell membranes and bones, magnesium takes up a large portion of structural base. Magnesium also plays a role in our body by helping out in the nutrient interactions and reactions which in turn increases absorption and balance in the body. Magnesium plays the key role in absorption of calcium. There are many health benefits of Magnesium oil, and here is a list of few of them. Magnesium is an extremely rich source of all the essential oils that our body needs. The application of magnesium oil on your body can make it soft and rejuvenated within few days. It also has some cleansing benefits to make your skin glow. As previously said, lack of Magnesium in our body results to Insomnia (lack of sleep), thus proper presence of magnesium in your body can improve your sleep. According to the researches, the Magnesium Oil provides you with relaxing and calming effect to your body, thus providing you with good sleep. We also know about how people suffer from PLMS (Periodic Limb Movement during Sleep) and RLS (Restless Legs Syndrome), and benefits of Magnesium oil include curing them also. Magnesium deficiency is highly responsible for the hypertensive and diabetes mellitus patients. We know that low Insulin can result into a high blood sugar, and it is a fact that Insulin is dependent on Magnesium. It thus controls the blood sugar indirectly. Even magnesium can reduce the chances of type 2 diabetes in your body. It also improves arterial stiffness in overweight people. Adequate magnesium in our body limits the cochlear damage (auditory portion of our inner ear) caused by acoustic trauma. It improves our hearing ability and is effective in healing both- Permanent as well as Temporary hearing loss. Magnesium along with the intake of proteins improves our bone density. According to some researches, it helps in recovering from bone injuries much faster. It is said that regular application of magnesium oil improves the contraction and expansion of muscle fibers, as deficiency of magnesium causes muscle cramps in many people. Due to this, many athletes apply magnesium on strained muscles before they perform. Asthma nowadays is a very common breathing problem which people usually inherit from their parents. During an asthma attack, the movements of the bronchi muscles become irregular. Magnesium works wonder to the affected people by smoothening the relaxation and contraction of bronchi muscles. When a person suffers due to dandruff, they tend to lose hair drastically. They take help of many oils and medicines, which may or may not cure it completely. Magnesium helps in reducing the inflammation caused due to dandruff on the scalp. Magnesium has the special ability to act as a pain reliever. During the pre-operative and post-operative periods, it is prescribed to the patients to reduce the pain. Magnesium has the unique ability to improve the transmitting of nerve signals. It is also known to control the neuronal excitability. It has been proven that magnesium has the ability to provide essential constituents for most of our brain functions. Regular message with magnesium oil helps to soothe out the Migraine pain in the patients. While one is attacked by the hiccups, they do what not to stop them. Unfortunately, very few of them work out. Sneezing, having water or sugar are the commonest methods of stopping hiccups, but in this case rubbing of magnesium oil gently on the neck helps greatly in preventing it at one go. What is the right Way of Applying Magnesium Oil? Magnesium is available in both oil and edible form. But the more convenient way of intake is by applying it if you do not want to consume any extra tablets. Benefits of magnesium oil are many, but the proper application is equally important to get the best results. Apply Magnesium Oil just before you start exercising. Substitute your tooth paste with Magnesium Oil, or you can use it as a mouth wash. Instead of applying Magnesium Oil directly on your skin, spray it on the area you want to apply to. Take a magnesium oil bath and use it as foot soak during pedicures. How to use Magnesium Oil? Magnesium is nothing but a very highly saturated solution of Magnesium chloride in water. For the use of Magnesium Oil, there is no fixed or standard amount of oil to be applied or sprayed. Usually, the amount of 30-60 ml of magnesium oil spray is considered to be normal. Magnesium oil uses helps to restore the cells in your body to restore the deficiency of magnesium in them. What to avoid while using Magnesium Oil? While there a lot of benefits of magnesium oil, there are a few limitations to its usage. Few of the points are to be kept in mind and avoided while using magnesium oil. When we use Magnesium Oil on our body, it needs to be absorbed completely by our skin. So, you need to be careful that you avoid applying any other cream or lotion on your body. It may result in lack of proper absorption, leading to unsatisfying results. Avoid applying too much of concentrated magnesium oil on your body. It may not harm you initially, but may cause a burning sensation and itching on the skin. Application of magnesium oil is good, but too much of magnesium oil uses may lead to rashes. Patients who take medicines for heart problem should consult with the physicians and apply only under their guided provisions. What are the Side effects of Magnesium Oil? 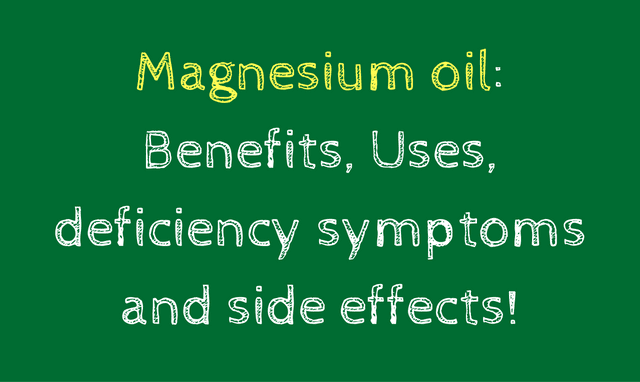 Though there are many Magnesium Oil benefits, it has some side effects as well. It is important for us to take into consideration that it comes with some of the downsides as well. For precaution purposes, it is essential to know about the harmful ways in which it can affect your health. After applying Magnesium Oil on your body, it causes a great deal of irritation and burning sensation on your skin. It is advisable that people with sensitive skin check it before applying on their body. It is a very common side effect of applying Magnesium Oil on your body. It gives rise to itchy and full of rash skin. Excessive use of Magnesium Oil can lead to diarrhea, which in acute cases lead to severe abdominal cramps. This may happen due to over use of Magnesium Oil. We hardly pay attention to many symptoms that take place unknowingly, and fail to recognize despite of the frequent sufferings we go though. Headaches are one of the main symptoms of Magnesium deficiency. It also results in diarrhea, or another extreme of constipation. It results in a decreased immune system along with loss of appetite, muscle cramping, irregular heartbeat, nausea and vomiting. In some cases, it causes Insomnia as well. Thus, it plays a very important all rounder role in curing our bodies. How can you make Magnesium Oil at home? Magnesium Oil is extremely expensive and it burns a big hole in your pocket if you want to buy them from shops. So what is the solution? Here is a guide of how to make magnesium oil at home without worrying about the money. Thus, the magnesium oil uses are indispensable in our lives as we suffer from something or the other very now and then. Magnesium oil benefits us in not only one but several ways to improve our lives. So, go for a bottle of one or just make it at home all by yourself. Excellent article! I’m glad that I stumbled upon it because I’ve been thinking about different skin care tips for myself. I think you’re absolutely right. I’ll be sure to follow your suggestion . Thanks for the great tips; you’ve been very enlightening! Thanks for the detailed information, it’s really an excellent assembly of info about the miracle mineral Magnesium. It is the backbone of the teeth and human skeleton and has multiple health and fitness benefits.